Accepted Scientific Name: Eriosyce curvispina subs. tuberisulcata (Jacobi) Katt. Origin and Habitat: Laguna Verde and adjacent areas, South of Valparaiso, Chile. Altitude range: 50-180 metres above sea level. Habitat and ecology: This species grows on rocky areas and cliff edges. Description: Eriosyce curvispina subs. tuberisulcata is a local or morphological form sometime included within (as a synonym of) Eriosyce curvispina subs. armata and the differences between this two subspecies are pretty subtle. They are not readily distinguishable if not for the geographical provenance. It distinguishes from standard Eriosyce curvispina by its larger flowers (ca. 4.5 cm long) and seeds (1 x1 mm). Note: Eriosyce curvispina subs. 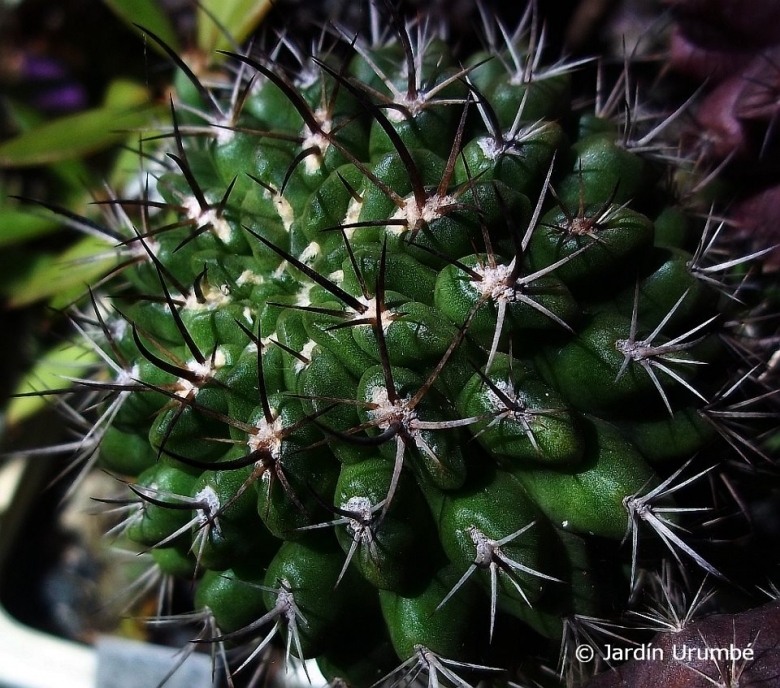 tuberisulcata correspond to Pyrrhocactus horridus sensu Ritter. Derivation of specific name: tuberisulcatus Lat. 'tuber', tuber, swelling; and Lat. 'sulcatus', furrowed; for the deep furrow separating the tubercles of the ribs. Stem: Simple or sometime in clusters of 9 or fewer heads, globular, to flattened spherical, dull-green, depressed and almost spineless at apex, often 20 cm in diameter. Ribs: 14-20, prominent, obtuse, strongly tubercled, separated by narrow intervals. Tubercles arranged in weakly spirally rows, at first elongated, sharp, later roundly prominent, with a flattened acute chin-shaped protrusion below the spine cluster. The old tubercles more or less incised with a broad furrow on the lower part separating the tubercles. Areoles: At first small, spineless, with an abundance of white wool but when old large. Sometime 1.5 cm in diameter. Radial spines: 10-12 strong, compact, cylindrically in cross-section, spreading, white gray to near black, gray in age, often in the upper part of the areoles there are 3, shorter and much finer spines, that are straight, and upright-protruding. Central spines: 4(-5), crisscrossed, similar to the radials but a little stouter and longer, at most 2,5 cm long, about 1 mm in diameter, thicker at the base (more than 2 mm), the lower one, stronger and noticeably bent toward the apex, dark rose-coloured to black, becoming yellowish-grey. Flowers: 4.5 cm long. Petals carmine with a light yellowish border, areoles on the pericarpel and floral tube sparingly woolly. Cultivation and Propagation: It is a summer grower species. It is easy to cultivate but somewhat rot prone if kept in a non ventilated place. Soil: It require a very fast draining drying soil. Waterings: Water regularly in summer, but do not over-water.